As a scratch builder, one of the things you were always trying to do was build chassis that would be properly balanced and tuned just as they came off the jig block. No cutting off pieces of the chassis, or adding lead weight required. Toward this end, certain designs would require drop arms and/or floppies with holes or cutouts to shift the center of mass, or lighten the overall chassis WITHOUT changing the center of mass, or some such. This became especially important as aero effects were perfected and overall chassis weight began to drop. How do you make these holes or cutouts in thin sheet brass without curling, dimpling, stretching or other wise distorting the material? One way was to lay out the pattern using dye and layout tools (scriber, rule and square), then drill holes at the corners, and cut out the pattern using a jewelers saw. Final cleanup would be done with a fine file. Very slow. Later on, builders would substitute a Dremel with a cutoff wheel for the jewelers saw. If you were doing square corners (and most everyone did), you didn't even have to drill holes first. This went faster, but there was a significant amount of cleanup to be done with the file. Finally, some enterprising racer/builder showed up at a race with a hand tool that was simply the most diabolically clever device I had seen in a very long time. Imagine a hand tool about 7 or 8 inches long, shaped like a narrow V. One side of the V is the body of the tool, and the other side is the operating handle. You hold the tool in one hand, and feed the sheet metal material with the other hand. 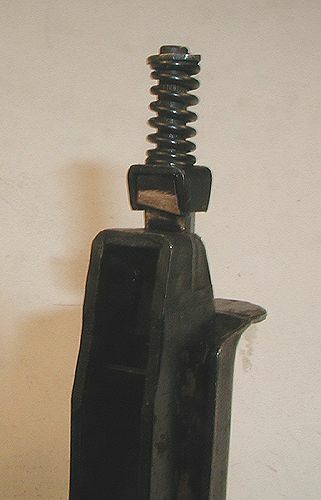 The working end of the tool consists of a small anvil, formed by the body of the tool, with a shaft running through the body, connected in lever fashion to the operating handle. Squeezing the operating handle would pull the shaft, which had mounted on it a spring loaded clamp (to hold the sheet brass material against the anvil), and a blade (to cut off a small chunk of material). A big bite was about one quarter inch wide (the width of the cutting blade), and one sixteenth deep, and you could take bites like this without curling or distorting the material, in brass up to .063 inch thick. You could do square corner cutouts in floppies and need only minimal cleanup with the file. You could do square or rectangular holes in drop arms by drilling one hole in the center big enough to fit the clamp and blade through, and then cutting out all the rest with the tool. Clever, huh? Ka-chunk, ka-chunk, ka-chunk. The tool is called a "Nibbler" and the process is called "nibbling". Nibblers used for scratchbuilding chassis are manually operated cutting tools for making cutouts in sheet metal parts, such as drop arms and floppies, without bending, curling or otherwise distorting the material. The nibbler works by cutting, or "nibbling" small, uniformly sized chunks out of the sheet metal material being worked. This nibbler is made by Adel Tool Company of Chicago, and can cut soft sheet steel up to .047" thick. I've used it to make cutouts in brass plate .063" thick without undue difficulty. 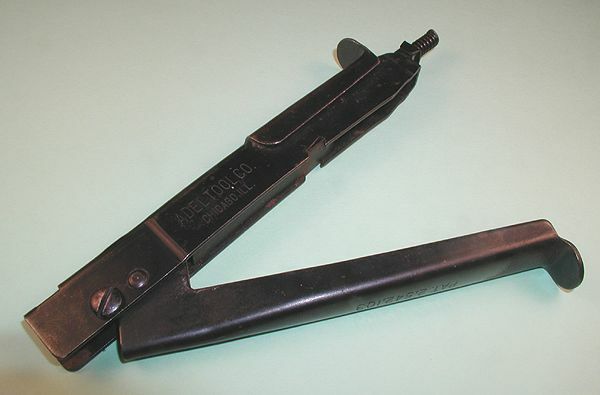 Nibblers like this one cannot be used to cut sheet spring steel, and must never be used to cut piano wire.